Reading Eleven Doctors, Eleven Stories has been an interesting experience. 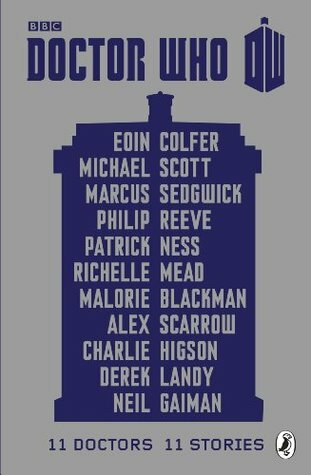 Over the course of last year, these short stories got released as e-books, in celebration of the 50th anniversary of the Doctor Who series. Here, they’re collected in a chunky volume, wrapped in a silvery cover. Physically, it represents an imposing read. I have read more imposing books – books with 1,000+ pages that threaten to break your wrist while reading. Worse yet, they have the potential to break your nose if you read them in bed. I imagine some slimming might have been achieved with a slightly smaller typeface. Anyway… content. I had intended to ruminate on the reading rather than the carrying. It has been a mixed experience. It’s hard to tell whether the best stories come down to writers capable of capturing a character in print so effortlessly, or if some Doctors just had more distinctive personalities. Take the Ninth Doctor, for example. Charlie Higson‘s “The Beast of Babylon” benefits no end from his getting the style, manner and speech patterns of the Doctor down pat. While Derek Landy’s “The Mystery of the Haunted Cottage” could have done with more time and space to expand into a satisfying story, he manages a similar feat to Higson and David Tennant’s performance comes through, staccato-style and peppered with brilliant. Less successful is Eoin Colfer‘s “A Big Hand For The Doctor“, a story of an injured first Doctor up against a gang of child-stealing pirate-aliens. Not only does he not get the feel of the Time Lord right, but he seems to struggle against the way we have come to perceive the Doctor. Because the TV series has developed and the passage of time means that Who in the 60s or 70s comes across as very much of its time, it’s something you have to suspend disbelief for. The First Doctor doesn’t reference Harry Potter much in the original TV series because, well, he didn’t exist. Yes, The Doctor travels in time and so making reference to actual stuff of the present day makes perfect sense… but, reading it, little things like this just jar slightly. They feel wrong. On top of that, the first story has a twist in the tale that just didn’t sit well with me. I saw it coming far too early and didn’t enjoy it much when confirmation struck home at the end. To be fair – and so as not to warn you off – the good stories in this volume easily outweigh the less good. The Sixth Doctor’s story stands out as another one to avoid, but that’s just two out of eleven that made me wish I’d spent my time more wisely. We follow the Sixth Doctor’s adventure from Peri’s perspective – and it doesn’t feel right. It doesn’t feel very Peri, for a start – and something about the egotistical Sixth Doctor means a story told from another character’s perspective doesn’t sit well. For anyone running Doctor Who roleplaying sessions, I can see several stories providing a basis for adventures. The Third Doctor’s “The Spear of Destiny” has all the potential for a rip-roaring gaming session, with frozen woods, rampaging Scandinavians, and warring almost gods. The Fourth Doctor’s “The Roots of Evil” takes place in the fascinating setting of a living tree space station… which sounds like a great place for a game – and warrant further consideration, as the story identifies the example herein as an unusual example of what would otherwise be an enormous terraforming construct. Definitely worth reading, even if you just grab copies of the individual e-books. I’m almost finished with the final story – by Neil Gaiman – and then I’m off to find something new to read. 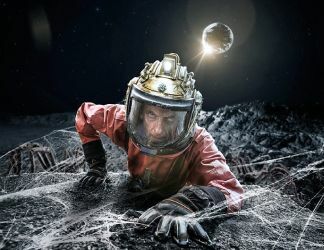 This entry was posted in Books, Review and tagged Charlie Higson, Doctor Who, Eoin Colfer, Neil Gaiman, Time Lord on October 16, 2014 by Paul B. Days of delicate hard work and now look at it… The whole plan up in smoke because you messed with my careful (and entirely suspicious) preparations. So, The Doctor gets a job as the caretaker at Coal Hill School, on the trail of the relentless and terrifying Skovox Blitzer (it’s a sort of crab/spider/robot thing that probably would have suited an appearance in the Sarah Jane Adventures – and that isn’t a bad thing). Left unchecked the deadly robot could destroy all humanity. 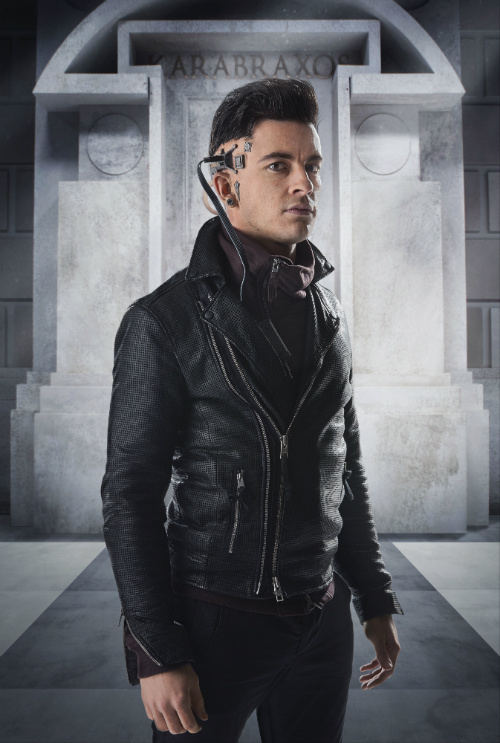 However, the fate of the robot has a secondary role in the episode, which has a great deal more to do with the triangle of The Doctor, Clara and Danny Pink. I can see how some people might really dislike this episode. My wife didn’t like it much, and the fleeting glance I gave to the odd review here and there didn’t rate it. In a series giving a lot of nods to classic Doctors, this one had Jon Pertwee‘s Third Doctor layered on thick. From the Doctor’s introduction as the new caretaker, John Smith, through gadgetry and martial arts (or was that an earlier episode) – this was classic Who. I can almost see Pertwee dressed in the classic brown coat of the working caretaker, with screwdriver in hand and pencil lodged behind one ear. Courage isn’t just a matter of not being frightened, you know. It’s being afraid and doing what you have to do anyway. This was a good episode. 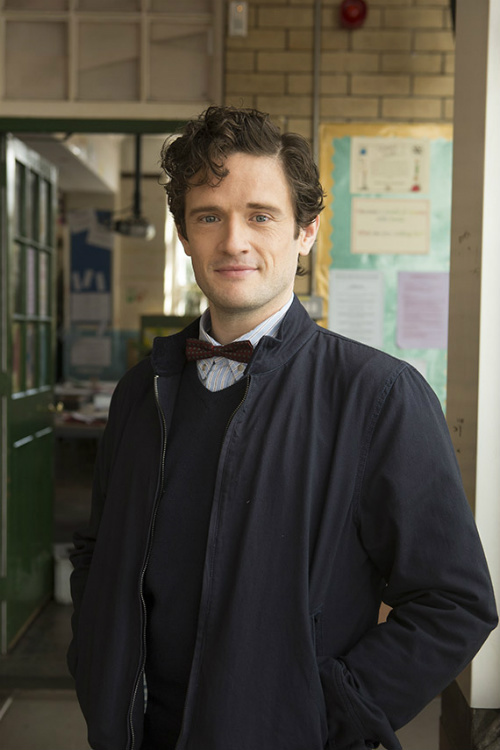 I loved the fact The Doctor got the wrong end of the stick about Adrian (pictured), the other teacher with a vague resemblance to a certain dashing bow-tie wearing Time Lord. It gave us the chance to see a little more of Clara and Capaldi and a bumbling Doctor up to something that isn’t clear to everyone else. He’s trying to be inconspicuous and achieving exactly the opposite. Yes, it is a bit obvious in places. It is trying to show the difference between Pink and the Doctor, the two ex-soldiers who seem to handle their issues in the same way and yet so differently. Clara loves them both , though one love grows increasingly strained, and the other love suffers from her wrestling heart. The threat wasn’t a big one. It did remind me of Sarah Jane. I’m sure it’s something to do with the special effects. I love a real, physical robot more than something rendered in CGI, but you need just the right film, director, atmosphere, etc. for a genuine sense of threat. This is tea time action adventure, so you’re never going to get that. More Missy at the close and an assistant, Seb, ‘because she’s a bit busy at the moment’. The Nethersphere – Paradise – seems to be a busy place. Whatever is she up to? I guess it grows increasingly unlikely to be River Song, as I previously supposed. Also, I doubt it’s The Rani, unless she’s swayed from her interest in the purely biological-side of experimentation. She was all about weird experiments – and Paradise seems to have more sinister undertones. I really do like the way the current series has played with facets of the old Doctor, echoes of incarnations past in story and characterisation. I have no idea whether that will factor into the last double episode or not – or whether it just all ties back into the aftermath of the 50th anniversary story arc.